Guess who's been having nice weather? This gal! I'm sure that I've jumped the gun a little in the garden but I just couldn't help myself. Our sky has been filled with sunshine and the temps are in the mid 60's. Yesterday I spent ALL DAY outside. I cleaned the stalls in the barn, turned the compost and manure piles, cleaned the chicken coop, and worked in the garden. I planted peas, lettuce and the onions that didn't get big enough last year, directly into the garden. So after all our hard work, how is the soil this spring? In a word... Awesome! 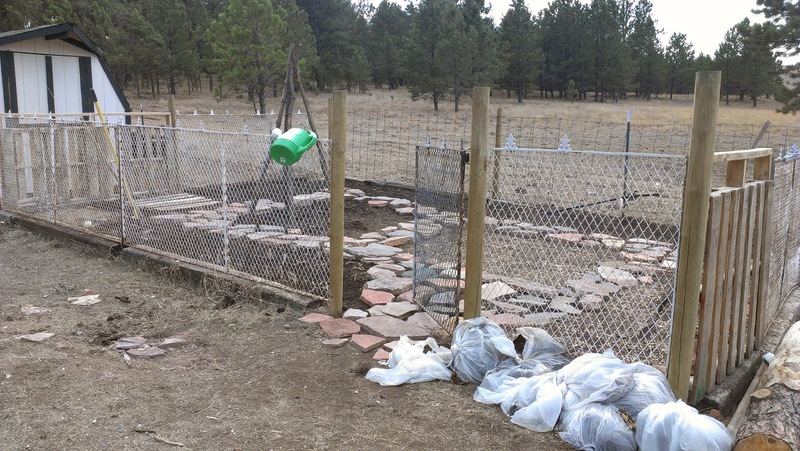 We never got around to covering the entire garden with wood chips to over winter, so the only spot covered was where the tomatoes were. 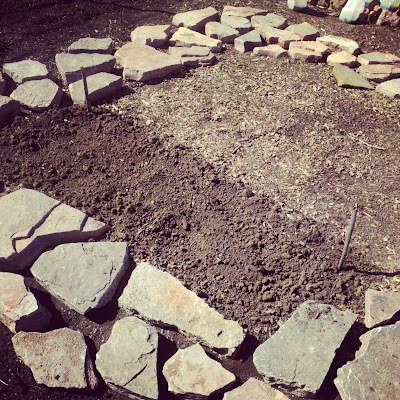 While all the soil is rich and beautiful, where the wood chips were it didn't need to be broken up. 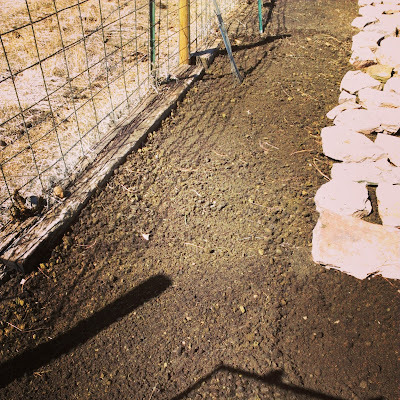 Wood chips had prevented the soil from compacting with all the snow and moisture. I was able to work the soil about 6 inches deep with just a rake. This will be a perfect spot for my carrots. We need to get into gear and get our wood chips hauled in. You may have noticed some new additions to the garden. Nathan and I made a bean trellis. It still lacks the horizontal rungs, but we'll get there. 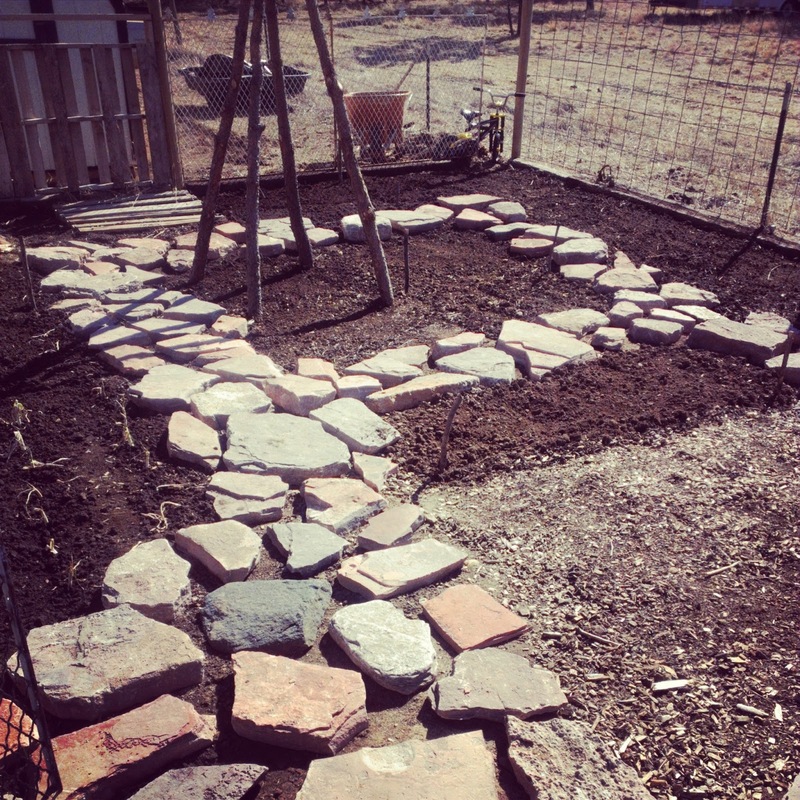 We also moved stones from the back of the house into the garden to make a path. When we add the wood chips they will be level with the ground. Note all the bags of coffee grounds. I have this stuff coming out of my ears. 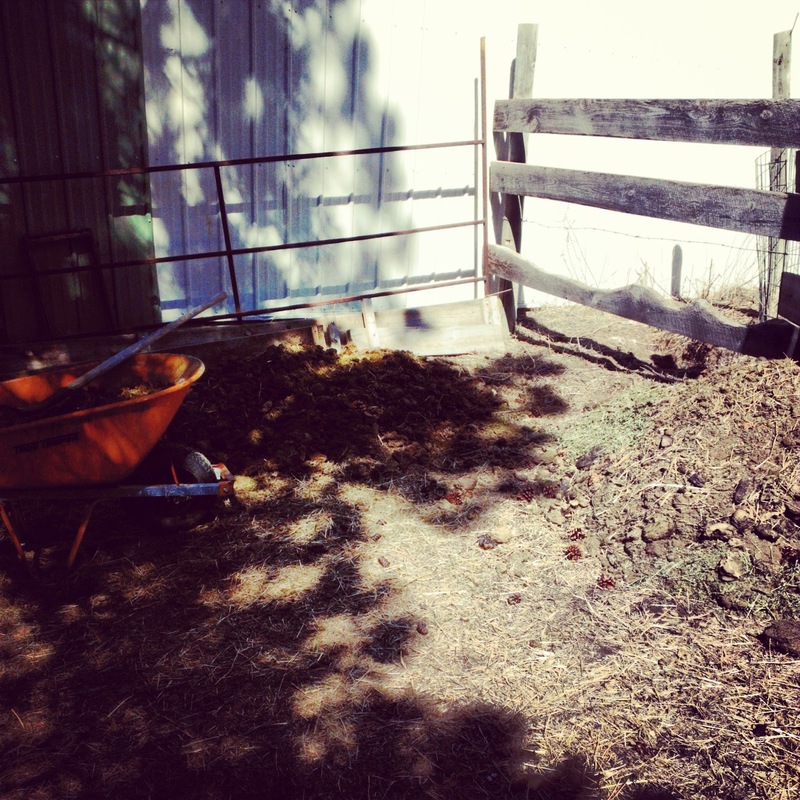 I also added a wheelbarrow load of old manure to the area where I'm going to plant tomatoes, cucumbers and peas. They can use the extra nitrogen to get established. 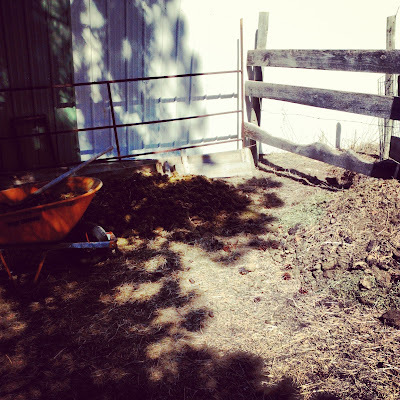 When cleaning the stalls, I started a new manure pile for summer. I don't want to mix the aged stuff with the fresh. Shoveling cow poo is a dirty, dusty job but the benefits are great. Organic manure to add to my compost pile and garden. No smell and nutrient rich. Pictures don't do this stuff justice. Welcome Spring! I'm so glad you're here! I really like your stone walk way. It looks great. We have never had a garden, so there is a lot that still needs to be done. This week will be the last week below freezing for us. My husband is going to loosen the soil with the tiller. Then we are going to use cardboard and wood chips. I've been playing in the dirt too! 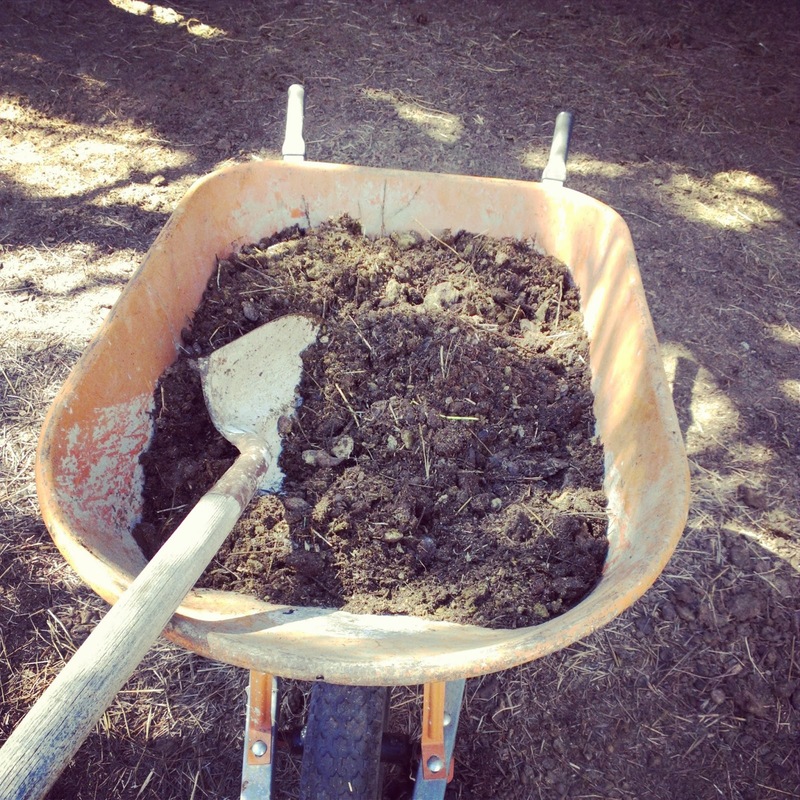 ...and also shoveling manure. :) I'm trying to re-claim an old garden spot that has gone wild, plus the fence needs repairing. I'm going to be quite sore in the morning. Oh your garden area looks wonderful. 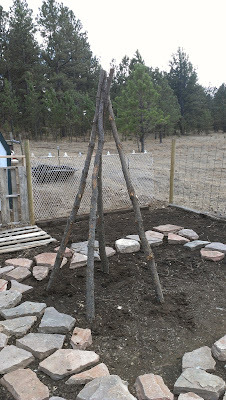 We didn't do raised beds this year...yours with the timbers and fence...appears to be raised somewhat. I wish we'd continued in this manner. The weeds have already begun to take hold! 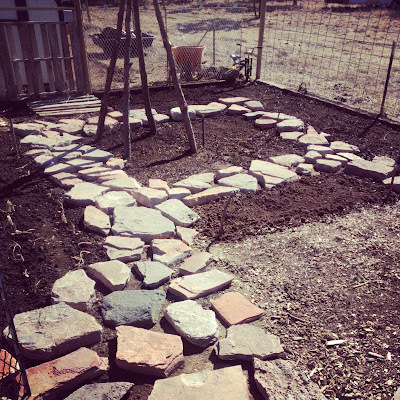 I like the idea of a rock path. I've been working with rock this week myself. Only...our weather turned rainy today, and we had a 'gully-warsher' LOL!